266 WRIST SPLINTRecommended in cases of fractures, after removal of a cast or injuries to ligaments, muscles and tendons. 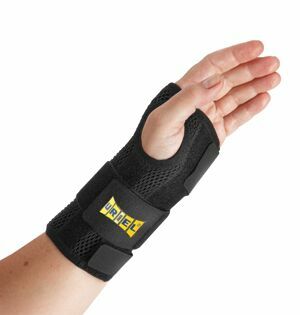 Designed to provide a strong support and tominimize movement of the wrist. Holds the hand at an angle of approximately35 degrees to the wrist. The angle can be adjusted by slightly bending the aluminum splintCautionFor external use only. Do not use the product if you are allergic to one of itsingredients. Material Composition: 95% polyester, 5% spandex.